Bungalow 47 paint & Junk Gypsy paints myself, however, there are a lot of myths surrounding this paint that frustrate me as chalk paint user and retailer. Because you and I are so close (I feel like we’re friends), I can share with you the truth about chalk paint. You can help me debunk these myths where ever you go. You need a special brush to use chalk paint. Anyone who tells you this is trying to sell you a brush. They are usually about $30. Am I right? Well, let me relieve the strain on your wallet, no you don’t special brushes. You can use any brush you want. I prefer Purdy brushes myself because I use them a lot and these hold up to the abuse of daily use and washing. But you can use a brush from the dollar store if you wish. This goes hand in hand with the myth above but some people believe you can’t use a roller with chalk paint. Poppycock! I roll this paint all the time. I like a sponge roller because it gives me a nice smooth finish. You just have to wet the roller and then ring it out before you start (the roller should be damp NOT soaking), then roll away! You can’t use a clear coat on chalk paint. You have to use wax. Fiffle! I use clear coat exclusively. I have a small child, run a business, and try to maintain my personal sanity. I don’t have the desire or time to rewax furniture every two weeks. If you like the feel of wax and you like it then go ahead. I don’t begrudge you a thing. But it’s a personal choice, not the only way chalk paint can be protected. Just remember to use really thick hot pad holders under plates if you use it on a dining room table. Wax will melt. You can make your own chalk paint. UHG! This one really bothers me. You can’t make a latex paint into a chalk paint. No, you can’t! Don’t argue with me on this one. Just like you can’t dry out an oil-based cosmetic foundation and call it a mineral powder. There is no alchemy that will make a latex into chalk paint. Laytex paints retain all the chemicals and health concerns. Unlike chalk paints which are low to no VOCs. I said above chalk paint is low to no VOCs. 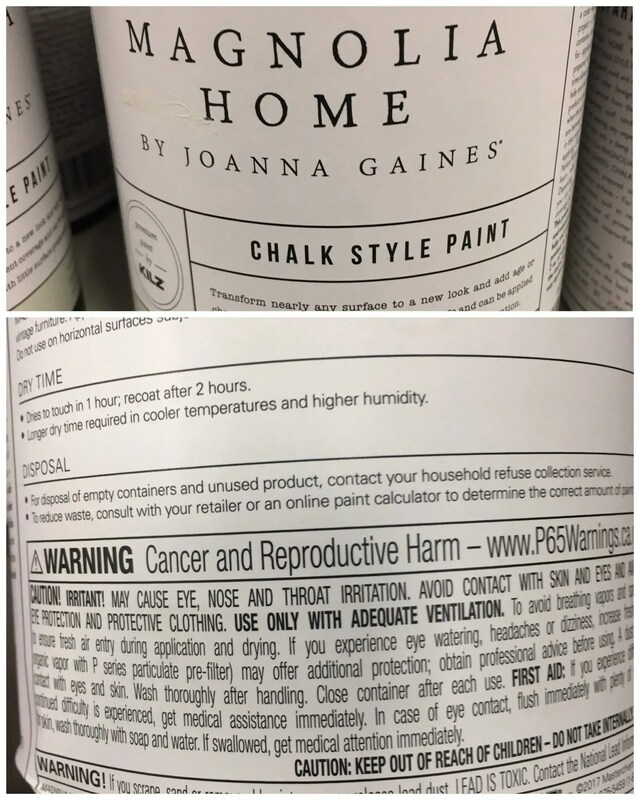 Check out the warnings on this popular brand,Magnolia Home, chalky finish paints. Certainly not low or no VOCs with warnings like that on the label. Now that we’ve debunked these myths if you’re ready to start painting watch the video tutorial below on chalk painting 101. There is a learning curve but you will love it when you start using it! Comment below if you’ve heard other myths you think need to be debunked! Don’t forget to sign up for my email list so you can download your FREE Furniture Flipping Toolkit! It’s packed with Pro Tips and Worksheets that will help you get a handle on your flips.